what it would be like to, to put it bluntly, "evolve." There are some moments in my life I wish I could evolve. Like when you’re carrying a heavy cardboard box and you come to a door that is closed. A literal third arm would come in very . . . handy (too early for a pun? Sorry). While there’s many reasons I don’t believe evolution played a role in how I became the specimen I am today, if I DID believe I was a part of a Slow-Level Improve-Myself Evolution program (or SLIME for short), I would definitely have my own list of things to develop. It would be a little like a ‘bucket list’, which is a list of things you want to do before you ‘kick the bucket’. A SLIME list is a register of bodily changes my family line is currently working on evolving. It would be necessary to have such a list so our family line knows whether their evolving sessions should concentrate on developing a reversing eye in the back of the head or a volume dial to adjust hearing levels. - Elbows that have the ability to bend the opposite direction so you can comfortably reach your back and scratch it, or give yourself a shoulder massage. - Tonsils to become something useful, like a ‘flavor gland’ that can squirt a pleasant tasting substance onto food you don’t like the taste of, but your mother-in-law put so much effort into cooking. - Both guys and girls having the ability to control the length of hair on their head, including eyebrows, eyelashes, ears, beard stubble and nose hairs. - A USB port in the hip to facilitate charging mobile phones while in your pocket. - A digestive system that requires regular intake of chips, chocolate and ice cream to function properly, in exchange for having to drink several glasses of water a day – which will become an unhealthy option. - Appendixes will be phased out altogether and, with the now spare room, the bladder’s capacity will be increased. - And most of all, the ability to attach ourselves to an email, so we could travel to the other side of the world in an hour or so, depending on my families file size and the connection speed of our internet. 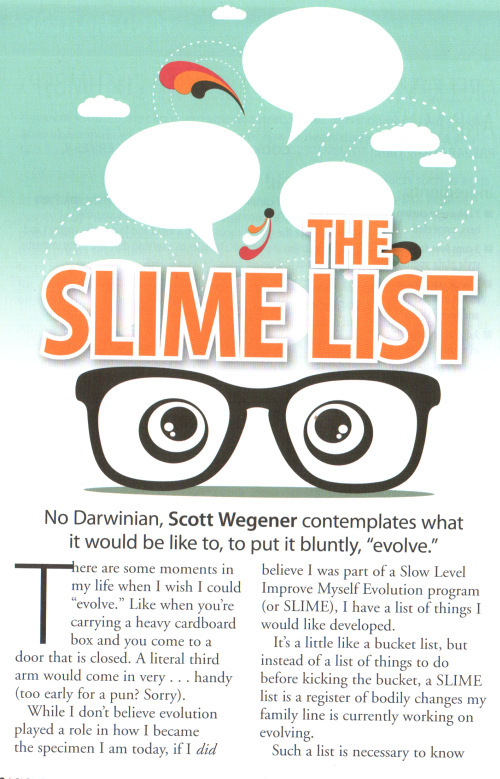 It’s kind of tragic that I’ll never get to live the benefits of my brilliant SLIME list. But hopefully my great-great-. . .[insert a million more greats]. . . great grandchildren will enjoy the ability to adjust the length of their nose hair at will. Ok, so I don’t believe my body is the result of billions of years of small upgrades, to become the human I am today. And neither do I believe I can further evolve to be able to enjoy developments such as a radar system to aid the dark, middle-of-the-night, bathroom treks. I do, however, honestly believe we will evolve in the future – because the Bible says we will! Now there’s an evolution of our bodies worth contemplating – bodies that never age and die. Revelation 21:4 “He will wipe every tear from their eyes, and there will be no more death or sorrow or crying or pain. All these things are gone forever." So it seems, if you believe, you will in fact evolve. I sincerely believe, and hope you do to.